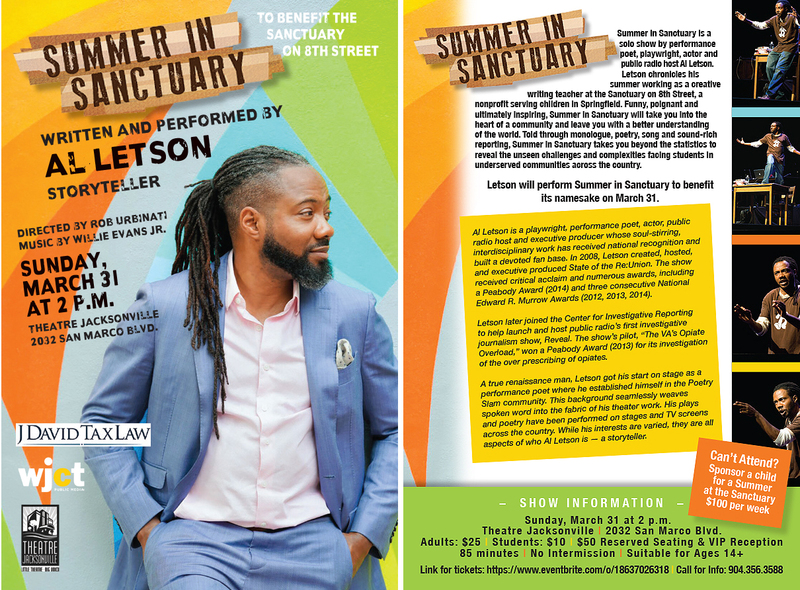 Music by Willie Evans Jr.
Summer in Sanctuary is a solo show by performance poet, playwright, actor and public radio host Al Letson. Letson chronicles his summer working as a creative writing teacher at the Sanctuary on 8th Street, a nonprofit serving children in Springfield. Funny, poignant and ultimately inspiring, Summer in Sanctuary will take you into the heart of a community and leave you with a better understanding of the world. Al Letson is a playwright, performance poet, actor, public radio host and executive producer whose soul-stirring, interdisciplinary work has received national recognition and built a devoted fan base. In 2008, Letson created, hosted, and executive produced State of the Re:Union. The show received critical acclaim and numerous awards, including a Peabody Award (2014) and three consecutive National Edward R. Murrow Awards (2012, 2013, 2014). Letson later joined the Center for Investigative Reporting to help launch and host public radio’s first investigative journalism show, Reveal. The show’s pilot, “The VA’s Opiate Overload,” won a Peabody Award (2013). A true renaissance man, Letson got his start on stage as a performance poet where he established himself in the Poetry Slam community. This background seamlessly weaves spoken word into the fabric of his theater work. His plays and poetry have been performed on stages and TV screens across the country. While his interests are varied, they are all aspects of who Al Letson is — a storyteller. Shindig to benefit the Sanctuary will be 6 to 9 p.m. Friday, Sept. 20 at the Garden Club. The 11th Annual Avondale 5K Classic is Saturday, Oct. 12.